Amman – The streets in Amman's Jebel al-Weibdeh are crowded in the early evening with sounds of young people looking for a place to relax. Coffee shops intermix with art studios selling crafts for tourists. At the Maestro bar and restaurant, a band is getting ready for a live performance. The lights are dimmed and someone has put "no smoking" signs on the tables – they are out of place with the ash trays. Apparently, Monday has jam sessions and anyone can bring their instrument to join in. But it's Wednesday. The oasis that is this small neighborhood in the center of Amman is in contrast to much of the rest of the city. Amman has a population of over four million, and the city never seems to stop when you try to drive out of it. Every hill is clustered with walls of three- and four-story houses. There are few exceptions to that rule of building, and most of the urban sprawl looks the same. Almost half of the Kingdom of Jordan's population lives here. The kingdom has come through the crises of the last decade in the Middle East relatively unscathed. It didn't suffer from the conflict of Syria and Iraq – two of its neighbors – and it doesn't have the simmering conflict that buffets Israel and the Palestinians. Only its southern neighbor, Saudi Arabia, appears to be as stable. They are both kingdoms, and kingdoms weathered the Arab Spring well. Algeria's longtime leader Abdelaziz Bouteflika resigned this week – a reminder that these regimes of Arab nationalism are still in flux from their origins in the 1960s until today. For Jordan, the years when it appeared to almost be a front line state against the chaos and conflict in Iraq and Syria appear to have passed, but the effects of those conflicts are still deeply felt. In 2016, an estimate in Jordan put the country's population at 9.5 million, including 2.9 million "guests," as The Jordan Times called them. At the time, there were almost 1.3 million Syrians and 130,000 Iraqis who had fled conflict to the security of the kingdom. There were also more than 600,000 Palestinians, who differ from the other Jordanians of Palestinian origin in not having national ID numbers. There are several million Jordanians of Palestinian origin who are citizens – and two million of them are classified by UNRWA as Palestinian refugees. This is the complex diverse mix that the kingdom has balanced over the years. It makes the country one of the major recipients of refugees from the region, affected from generations of wars going back to the 1940s. It so happens I was near Irbid speaking with Syrian refugees. The area is pastoral and has new infrastructure projects, such as an industrial zone and solar panels. The winter rains have brought out green tufts of grass, laid down like a carpet on the usually dusty and tan desert landscape. Like so much of the country, the area is a mix of small family homes, people herding sheep and pastoral towns. Despite the refugee crisis that saw some of the border towns double in size, there isn't a visible sign of a continuing crisis. The Syrian population in Jordan is young, and its demographic appears to be more than half under age 18. The UN says that 48% are under age 15. Many marry young and have up to nine children. If one does the math, that means that of a refugee population of 1.3 million, even if some have returned to Syria, the population is growing – and it is growing fast. It could be adding 50,000-100,000 children a year to the country's population. That would mean that in five years since the peak of the refugee crisis, there could be a quarter million or more Syrians born in Jordan. A study by Arab Renaissance for Democracy and Development said that between 2011 and 2018, 123,685 Syrians were born in Jordan, which they took from the UN Office for the High Commissioner for Refugees. That number may not reflect the total. Politics in Jordan seems to be a sensitive topic. 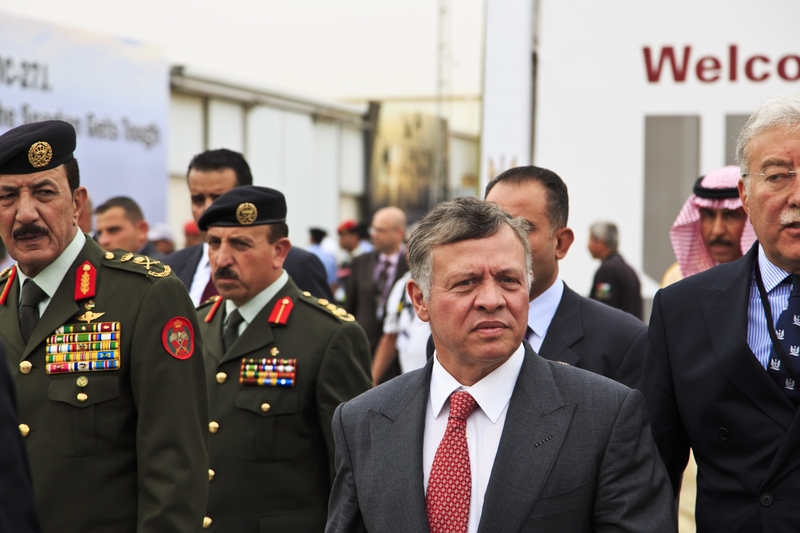 Publicly, local media hails King Abdullah's "steadfastness" on supporting Jerusalem, where Jordan is the custodian of the Muslim and Christian holy sites. He told a crowd in late March that he rejected any changes to the status of Jerusalem, and canceled a working visit to Romania after Bucharest announced its decision to move its embassy. Jerusalem is a redline, the King told a crowd in Zarqa. It is a redline because it is a unifying issue in Jordan – and the country wants unity and stability as it looks to the future.